Raspberries Rule! | Gardens Alive! Q. Mike, what are the best fruits to grow? A. Well Pat, the first answer that comes to mind is "the fruits you like the best"! But tree fruits, like apples and peaches, require a lot of care and attention. Cherries and blueberries are easier, but birds will fight you for every fruit; same with strawberries, which must also be protected from slugs and rot. That why MY personal favorite is raspberries! I started growing these tasty treats for my wife, whose fondest childhood memory was returning from her grandparents' patch with an empty bucket, a red-stained face and a huge smile. Lucky me, it turned out that raspberries are pretty much the easiest thing you can grow! There are two basic types. "Summer bearers" produce one crop a season—on the previous year's canes. New canes appear in the Spring, grow all summer, rest over the winter, produce a big crop the following summer and then are done. I do not grow this type personally. Easy to grow and stunningly delicious, raspberries are also one of the single healthiest things you can eat. One cup contains six grams of fiber, lots of Vitamin C, and a huge concentration of heart-healthy, cancer-fighting flavonoids and other beneficial phytochemicals. And that's just the fruits—raspberry leaves are used in a lot of natural healing teas. And finally, raspberries are also what's called a 'high value' crop, meaning they're darned expensive to buy in the supermarket, so the space you give them in your garden is extremely worthwhile, cash-wise as well. Above the Mason-Dixon line, plant new canes in the Spring; you can mail order some starts, or if you know someone with a patch, ask for some of their extra shoots—we raspberry wranglers are always pulling up strays in the Spring. The further you are down South, the more Fall planting may work better for you. Ask your local county extension agent for advice on timing and the best varieties for your specific region. Q. Mike: I love berries, but they don't love me. After four years of waiting for blueberries, I yanked the bushes out. I figured raspberries would be foolproof, but after two years all I have is vigorous vines without even a blossom! The bushes are in full sun and I add Holly Tone and lots of compost to the already rich soil. What am I doing wrong??? A. Blueberries need lots of sun and very acidic soil; you likely failed to provide at least one of those. But raspberries grow in sun or shade and don't need acidic soil, so the Holly Tone—a mostly natural fertilizer that also lowers pH—was the wrong way to go. That also leads us to the REAL problem here—your adding a lot of food to what you say is ALREADY rich soil. Stop with the compost and fertilizers! One of the best features of raspberries is that they prefer poor soil. I just give mine a couple shovelfulls of compost every few years and we get big healthy canes AND lots of fruit. If you overfeed them…well, you know what happens then, now don't you? Q. Mike: I love my raspberries! They are very low maintenance, and have made me quite popular in the summer (especially since the Presbyterian Church cut their patch down); my friends and I can pick 25 gallons in a season. But I am battling a red "rust" on the leaves. What can I do? I should explain that I'm not much of a gardener: I cut the dead canes and lay them on the ground around the plants for mulch, and if it's a dry summer, I water them, although that hasn't been an issue this year. A. Actually I think water IS at least one of the issues here. 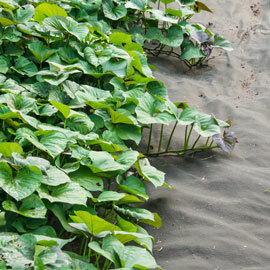 The only thing these plants absolutely require is good drainage, and you Alaskinians have a really high water table, making it hard for the poor plants to have dry feet under the best of circumstances. So stop any watering to help protect them from this disease, which is actually a form of anthracnose (although it IS called 'rust' when it appear on raspberries). Your poor man's mulch is the BIG problem. This disease over winters on diseased plant parts, so you have been spreading it by keeping those old canes around. Get rid of them, give the plants a little compost, don't irrigate and I bet your rust will simply disappear. Wish I could say the same for mine.